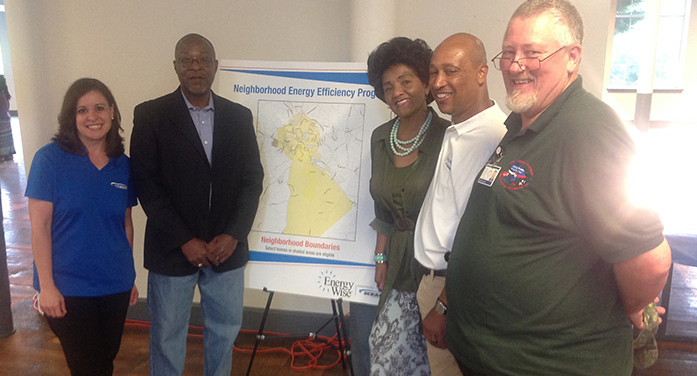 Board Member James Bibbs, second from left, joins with others from GLEAMNS and SCE&G in a cooperative effort. Head Start/Early Head Start – promotes school readiness of children ages birth to 5 years old from low income families by supporting their development in a comprehensive way through: Health, Education, Nutrition, Disability Family Services, Parent Involvement and Mental Health. Workforce Development Program which provides services to youth, adults and dislocated workers, who fall within the poverty income guidelines. This program assist with Workkeys testing, job search/employability skills, counseling and career planning, on-the-job-training, referrals, internship, and education assistance. Community Services Program available services are Rental assistance, residential heating and cooling bills, air conditioners, HVAC repair/replacement, and educational assistance. Weatherization Program – The program’s goal is to reduce energy costs to low-income persons by improving the energy efficiency of their homes while ensuring their health and safety. Weatherization specifically focuses on assisting low-income people – primarily the elderly, persons with disabilities, families with children, and households with high energy burdens. Family size – ONE; Gross Monthly Income is $1980.00; for each additional person add $690.00. Applications are available at our main office in Greenwood. To request an application, please contact us at 864-229-8836 or 864-229-8818. As a GLEAMNS Board member, representing Edgefield County, it is important to me to make sure Edgefield County citizens are aware of the services GLEAMNS provides and has full access to those services. It is also important to me, that GLEAMNS continue to develop partnerships that help to leverage our limited resources for our communities. Today, GLEAMNS joins SCE&G in helping ensure low to moderate households are using energy as efficiently as possible. We applaud SCE&G for their efforts, as all measures and supplies provided today are at no cost to our residents. We are thankful for our partnership with SCE&G and look forward to increased collaboration in the future. Like today, and always, you have my full commitment to continue working with GLEAMNS and other partners to further develop and improve our communities.